Aurora Rose Reynold’s books are an instant one-click for me. Her Until Series is one of my all-time favorites, and those Mayson brothers along with their seriously fantastic lady friends are some of my favorite characters around. (I mean hello, Nico Mayson anyone?) So when she started her Until Her and Until Him series following the children of those characters, I knew that I was in for another round of stories that I would completely love. Whenever I sit down to read a book by this author I know I’m going to get one outstanding read filled with fantastic characters, a story that just doesn’t quit, and one mesmerizing boom that I will feel so truly and deeply. Until Jax gave me all of that and more, and I loved every word I got to experience with Ellie and Jax in their heart melting story. Through every page, as I fell more and more under Jax Mayson’s spell as he gave it all he had to win over Ellie, I realized over and over again why this author’s books and her stories continue to be some of my favorites. The feels, the romance, and the overall experience of reading a book by Aurora Rose Reynolds is something truly memorable. I loved every single minute of reading this book, and by the end of it I just wanted more because I loved these characters, their heart squeezing story, and the phenomenal world of this book so much. Knowing and feeling so connected to these characters that I hated to leave them is just one of the many tells I had to know that this book was outstanding. Suffice to say, I loved Until Jax something fierce, and I can’t stop thinking and loving everything I got from Jax and Ellie over the course of their all-feeling, swoonworthy, and romance filled story. Sweet and endearing Ellie. Ellie was a seriously endearing character that my heart immediately cared and loved from the moment I met her in this book. Her character was previously introduced at the end of Until July, and I couldn’t wait to learn more about her in this book. Ellie is warm, loving, and a truly good person doing all that she could to take care of her daughter. She is selfless and kind, and the goodness that emanates from her completely won me over the instant I met her. The more I got to know her, the more I loved her fiercely. Over the course of Until Jax, a true strength develops in Ellie, and it was fantastic to see that side come out of her after everything that she goes through, and how that new side to her comes into play into the story. She truly is a gem of a character with a heart of gold that I completely loved. Jax Mayson stole my heart and I never want it back. 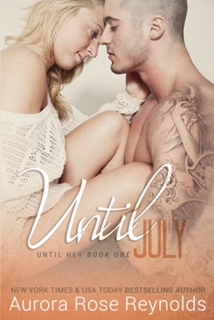 Jax Mayson stole my heart completely in this book. He took it from the moment he started calling Ellie baby and taking care of her and Hope, and he just kept taking more and more of it as this story continues. I gladly gave it all to him because that man is good. He is honest, and swoony, and has you falling so hard under his charming and spark filled spell that is bursting with so much feeling. Jax, like all of Aurora Rose Reynold’s male characters, is strong and protective and a definite force to be reckoned with, but can still be brought to his knees from one sweet little girl and her selfless as all get out mother. I loved that about him, and just how much he cared and did everything he could to protect his girls throughout this book. Jax is honest, persistent, and just a good guy, and you feel that on every single page. The build to the relationship and feelings. One of my favorite aspects to Until Jax was that there was such a build to the relationship that Jax and Ellie share. Sure there’s the boom and these characters have chemistry out the wazoo, but they both take it slow too because they know they need to for both theirs and Hope’s sake. Their cautious and patient, and they definitely hit some bumps in the road, but through it all they keep trying and pushing and fighting in hopes of being together. I loved experiencing that build, and it just connected me more to Jax and Ellie as they journeyed together in this story. That build made all that they were sharing more, and had me so invested in them both because of how their relationship so outstandingly begins, grows, and evolves. Moments you feels so truly in your heart. There were so many moments in Until Jax that I felt so deeply in my heart. Moments that had me feeling all the passion and fire hot chemistry Jax and Ellie were sharing. Moments that had me feeling the love and devotion that Ellie had towards her daughter, and how those feelings begin to develop and grow between Ellie and Jax. Moments that had me melting and swooning from the things that were coming out of Jax’s mouth balanced perfectly with the moments that had me wanting to shake some sense into that man for some of the things that happened. I felt and lived through all of these moments because of how thoughtfully Aurora Rose Reynolds crafts this book, and I loved every all-feeling moment I got to experience because it just made me love this story more. Twists and turns galore! 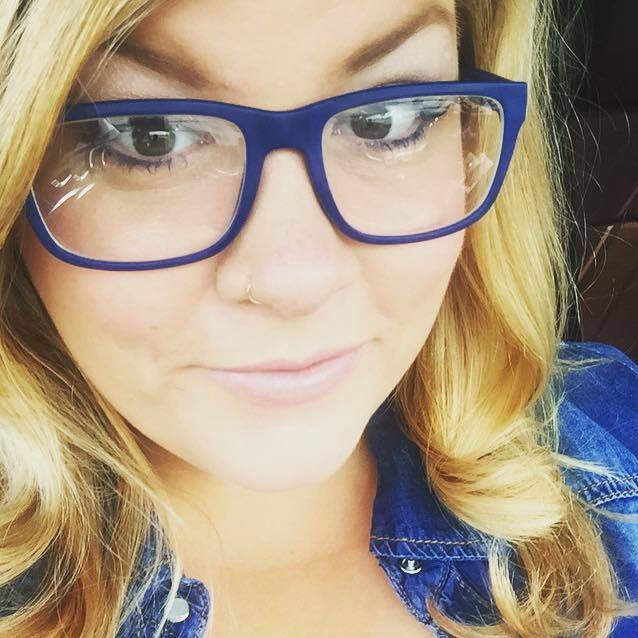 One thing that is guaranteed in a book by Aurora Rose Reynolds is twists and turns that keep you so beyond hooked into everything that you’re reading. Until Jax definitely has some twists and turns you don’t see coming, and I am telling you that your jaw will drop more than once while reading this book. The events of this story definitely put these characters in some situations they never thought they’d be in, and you will be so pulled into those events and what they bring out in both Jax and Ellie. Those moments make them fight and push and give it their all, and they’re truly magnificent to experience. The gangs all here! The supporting characters in Until Jax are fantastic, and I honestly loved each and every one of their fabulous and distinctive selves. You not only get to catch up with the original Mayson brothers in this book along with their wives, but you get the phenomenal chance to get to know all their children and what’s been going on with them. Aurora Rose Reynolds adds all of their characters into this story so seamlessly, and makes it so you have to know what in the world is to come with all of them too. Suffice to say, I can’t wait to see where this author takes their characters next as she continues this series! Here comes the firework level boom. Every book in this series has a boom. That person who these characters instantly connect and feel so much for, and that is what sets this series apart in the best way. That boom defines these books, gives them so much feeling and emotion right from the start. That boom is also bursting with so much hope and fight and firework level spark, and leaves you feeling so much right from the start for these characters because they experience that oh so remarkable boom. Aurora Rose Reynolds brings that aspect back once again in this book, and includes that into the story in the most extraordinary that leaves you knowing what that boom is so freaking amazing. 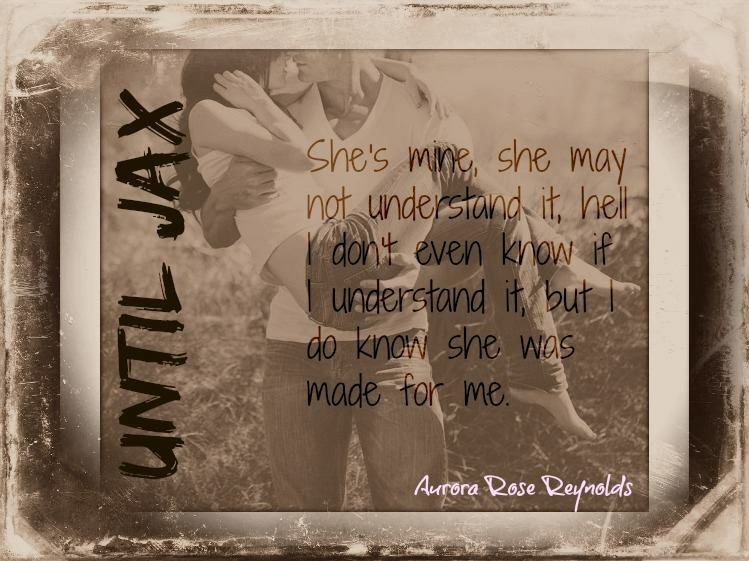 Until Jax was another all-around outstanding read from Aurora Rose Reynolds. It gave me all that I’ve come to expect and love from this author’s fantastic writing and storytelling, and honestly it gave me so much more to love. I loved every bit of this book, and every word that I got to so fully experience while reading. Aurora Rose Reynolds and her fabulous writing makes it so easy to sink right into what you’re reading from the moment you begin, and has you feeling and living through it all until well after you finish. Jax and Ellie completely won me over right from the get go in their story. They were real and honest and they both had their vulnerable moments where my heart just stuck to them like glue, and through it all I just felt so much for them. They are two fantastic characters, with hearts of gold, trying to make their way through the immense feelings and connection they are sharing, and in Until Jax you get a front row seat to it all. You’re with them every step of the way, and I promise you that if you’ve loved any books by this author or if you’re just a lover of love stories, then you will love this book. Until Jax shows what it means to truly give your all to someone, and that all is pretty darn spectacular to experience. Trust me. Ellie and Jax are so good and easy to love, and the spell they cast in this book is impossible to resist! Click to enter the giveaway! !